If there's one thing you've learnt from all my training, it's that I'm incredibly consistent, and it would only be appropriate to keep up my consistency with late "month in review" posts with March's being delivered half way through May 🎉. Thank goodness I'm not a paid blogger as I'd find myself unemployed PDQ!! On the topic… anyone notice a change around here a few weeks ago? Nope, good. You're an adblocker like me. If you did, or are just curious, I no longer show adverts on any of my sites. I wasn't making any money off them and was blocking them from my own views so decided to ditch them. Enjoy the new ad-free experience. Right, onto March's training and racing. 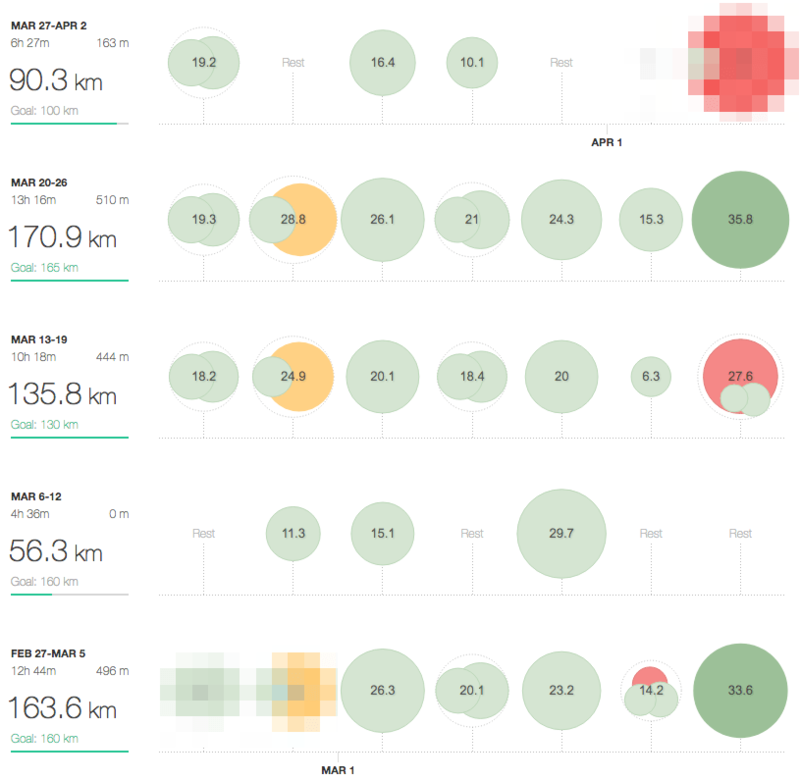 Things started off right where I left of in February — March started in the middle of a week 😆 — I finished off what became my largest every training week at 163.6km. I coped pretty well with that big week and definitely felt it in my legs at the end of the Sunday long run. I then rewarded myself the week after with a week in New Orleans. Ok, it wasn't really a planned reward. As luck would have it, work took me to New Orleans quite conveniently during a planned recovery week, and boy did I recover. I ate well, drank well, enjoyed working with my colleagues IRL (we're a 100% remote team dotted all around the US and Europe) and even squeezed in a few tourist runs. That recovery week was just what the doctor ordered and I came back to the UK feeling refreshed and eager to hit the road again. I jumped back into my regular programme and put in a good week of training. I kept things light on the Saturday as Sunday was the Fleet Half Marathon. This is a great local clubby race and this year they changed the last few kilometres to remove the steep hill at the end. This was a great idea as this last sting in the tail really put a dampener on what could and should be a PB race for a lot of people. This change certainly helped me to a fantastic new PB 😁. I somehow shaved nearly 30s off what I thought was already a great PB (set at the Wokingham half in February) and if it weren't so breezy, it could have been even more. A very blustery day out today and I didn't know how it would affect me so I headed out with the aim of finishing somewhere around 77-79 mins. Thing went really well when I was running with the wind but as expected became a bit of a battle into the wind. Felt really good and managed to keep a pretty good and consistent pace with the odd faster and slower kilometre. Had a bit in the legs to a good fast finish down the final straight to finish in a new PB by nearly 30s. I finished with a 1:17:02 chip time. It would have been nice to be three seconds quicker, but that wouldn't have given me a target for my next half 😄. The next week was a whopper of a week. Somehow I found the energy and motivation after the Fleet Half to put in a massive week of 170.9km making this my new largest ever week. Looking back over my log, it was only really the Wednesday medium long run in which I struggled. The other days went really week and I flew through the Sunday long run too. I finished off the month with another recovery week. This time, no travels for work, but I did travel up to Manchester for the Manchester Marathon (the big fuzzy red blob 👇). Whilst March ended up being my lowest mileage month of the year so far, it included two massive weeks and a fantastic new half marathon PB.